VietNamNet Bridge - Coral reefs have been damaged and are full of waste, and the number of fish decreasing due to poaching at the Hon Mun marine protected area (MPA) in Nha Trang Bay in Khanh Hoa province. The MPA is covered by the Heritage Law. Nguyen Thuc Quan, an overseas Vietnamese, said he has been to many countries and loves Hon Mun’s diversified ecosystem. The sea water there is much cleaner than many other destinations. However, he noted that the overcrowding of visitors in the area has led to increased pollution recently. “I feel sorry for Hon Mun. On the seashore, travelers eat and drink and then drop litter. 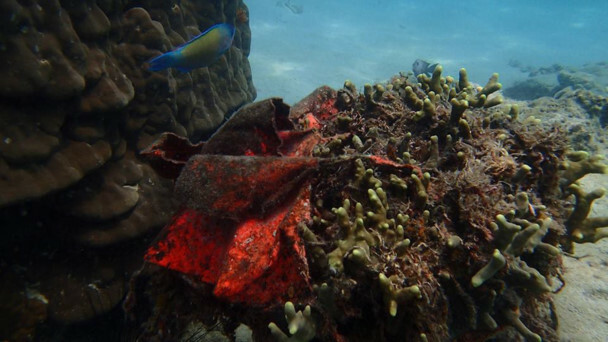 Under the sea, garbage is caught on coral reefs and no one cares about this,” he said. M.T, a dive instructor in Nha Trang, has posted on his Facebook many images he took in the northern and southern parts of the strictly protected area of Hon Mun MPA. Coral reefs have been damaged and are full of waste, and the number of fish decreasing due to poaching at the Hon Mun marine protected area (MPA) in Nha Trang Bay in Khanh Hoa province. The MPA is covered by the Heritage Law. “The number of fish are declining while corals are dying. There is so much garbage at the sea bottom,” he said. Also on his Facebook, T posted a clip filmed by a foreigner showing a tour guide diving and trying to carve the coral reef just to catch a tiny clamp. “Do you know that it takes a long time for a coral reef to take shape? Coral can grow by 1-2 cm only each year. So, please, protect coral, so that we still can see coral reefs in the future and see fish swimming when we dive,” he said. “If coral reefs disappear, the sea will suffer from ecological imbalance. If there is no coral, there will be no fish and there will be nothing for you to show to your clients when diving here. So you, for your bread and butter, destroy the marine environment and harm the sea diving industry,” he wrote on Facebook. Hon Mun MPA covers an area of 160 square kilometers. Hon Mun with its biodiversity is a favorite sightseeing destination for travelers. According to the Nha Trang Bay Management Board, the garbage flowing to Nha Trang Bay is from Quan Truong and Cai Rivers and coastal areas. An official of the management board complained that travelers drop litter and break coral reefs. Tens of cases of violating regulations on fisheries have been found. He said that that the management board has proposed to provincial authorities to carry out scientific research to find the maximum loading of the strictly protected area, so as to identify how many travelers and cruises can reach the area.